Sponsors of the OMNIKAL Annual Business Summit are the vital contributors necessary for the financial, technical, publicity, and administrative running of and success of the event and our community. Support from our Corporate Sponsors is essential to successfully achieving our mission and to increase awareness of and connection to business opportunities for inclusive majority supply chain partners. In return, sponsors are able to take advantage of the numerous benefits available. Sponsoring the OMNIKAL Annual Business Summit, placing advertising on our website and working with us to develop a customized content program are your opportunities to engage with our audience, discuss new and upcoming products and gather input from our digital ecosystem. Influential consumers, business leaders and entrepreneurs and visionaries through high impact, custom integrations. Put the spotlight on your company and extend your reach to over 2 million businesses as well as professionals attending the OMNIKAL Annual Business Summit. Identify the level of support that suits your budget or let us customize a unique sponsorship package for you. Conference sponsors are the organizations responsible for the financial, technical, publicity, and administrative running of the conference. Support from our Corporate Sponsors is integral to successfully achieving Omnikal’s mission to increase awareness of business opportunities for inclusive majority supply chain partners. In return, sponsors are able to take advantage of the numerous benefits available. Omnikal provides a unique opportunity for our sponsors to engage with digital media and advertising technology. Sponsors can connect to, gain insight, develop best practices and exchange thought leadership with our expansive database of inclusive business owners. Omnikal offers unparalleled in-person experiences and unique, high quality online interactions with over 2 million entrepreneurs. 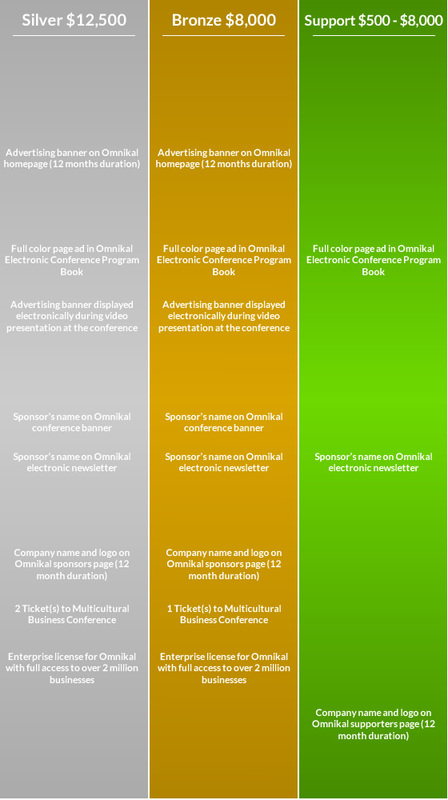 Sponsoring an Omnikal event, placing advertising on our website and working with us to develop a customized content program are your opportunities to engage with our audience, discuss new and upcoming products and gather input from our digital ecosystem. Our attendees and readers are – or should be – your customers and we work to ensure that you have the opportunity to engage with the individuals that mean the most to you and your business. Align your brand with influential consumers, business leaders, entrepreneurs and visionaries through high impact, custom integrations. Host participants at private cocktail/dinner events, conduct onsite polling, present a ‘Omnikal Excellence Award’, introduce a panel discussion, display product, participate in a C-Level video interview and amplify through onsite branding and extensive print, digital and social media promotion. Put the spotlight on your company and extend your reach to over 2 million businesses and professionals attending the Omnikal National Business conference. 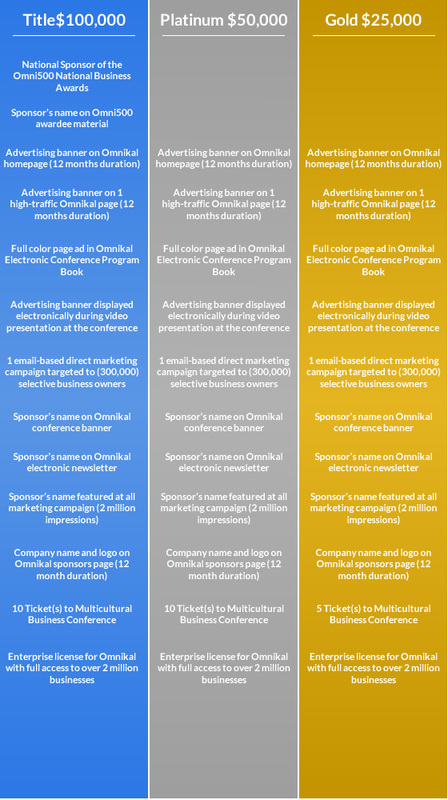 Identify the level of support that suits your budget or let Omnikal customize a unique sponsorship package for you. Take advantage of the opportunity to tie your brand identity not only to Omnikal’s millions of website visitors but to the general public through our social media exposure.